This time, I am sure. That is what I kept telling myself. I was sure of the colors, sure of the plan. 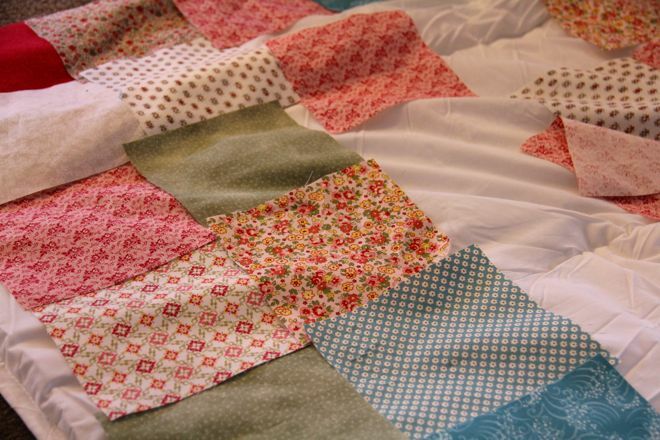 This would be a romantic, patchwork quilt, with no scheme... just randomly pieced, for casual comfort. La-di-da... 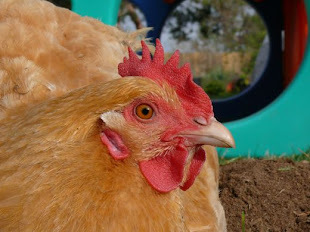 I sang, with the birds, and the chipmunks kept me company, while goats and chickens gamboled across the manicured lawn. I was organized, calculating, full of conviction and confidence, and dashes of whimsy! Today, I am here to confess a few things. I have what I am going to call Random Resistors. Some innate, stubborn, artistically rigid thread in my being will not let me just go for it! 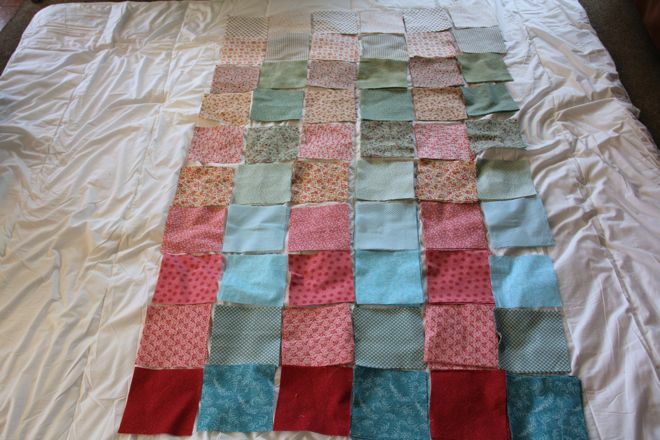 I could have tossed the squares in a sack, then sewed them together, pulling up one square at a time, and paying no heed to the order or rhyme. But, no. Max walked by and said something about tones and color intensity, and then I was obsessed with finding a pleasing aesthetic, something interesting, yet romantic, casual, whimsical, simple. Next, Maria and I were on our hands and knees, making a deliberate attempt at randomness. 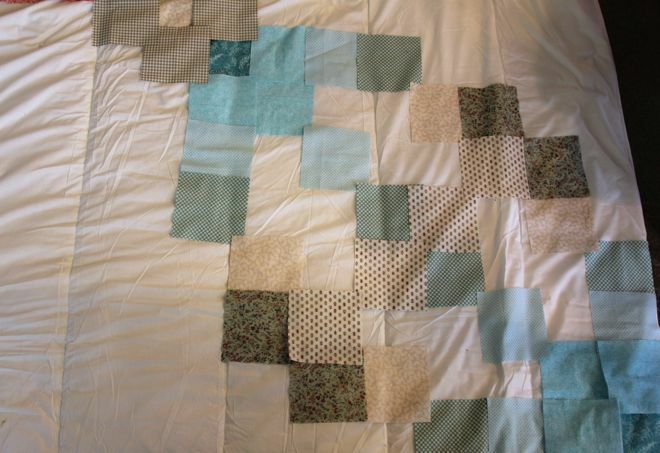 Then we tried different nine patch patterns. After that came reds in the corner, and alternating shades between. Hours later, I found myself not at all convinced and confident of anything. So, I called in an expert. It's been a long time since he does this, but Max has not lost his touch for design, and remarkable ability to see what's possible with what is on hand. 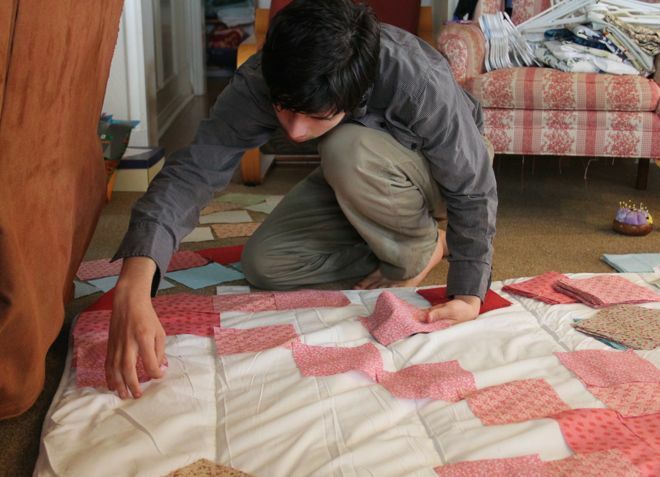 I love how beautifully he composed all the prints for his frog quilt, and so I watched, rapt, while Max sorted through all the possibilities. One challenge... 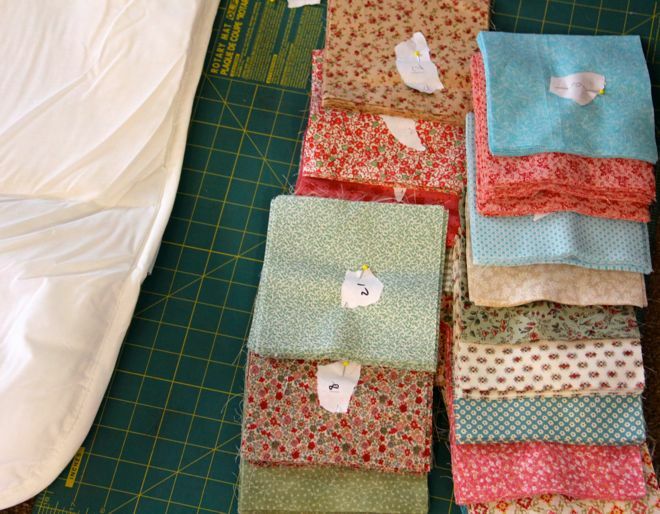 I have different amounts of twenty different prints, and nothing was cut or planned with an actual pattern in mind. 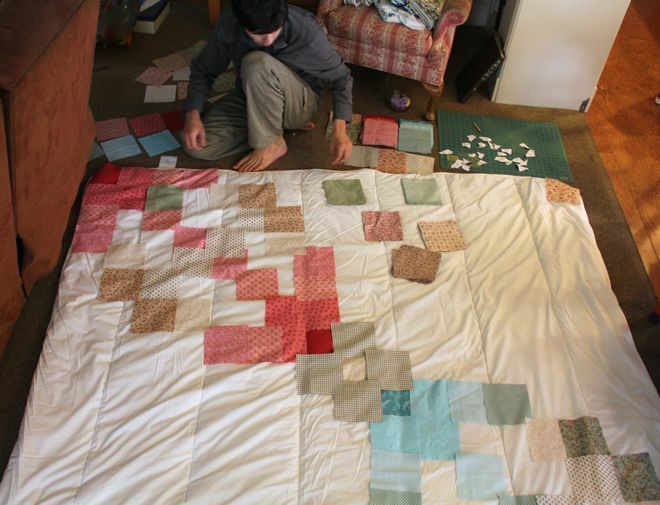 There can be no doubt Max was heading into a really beautiful pattern, but though we had a lot of squares, we did not have a lot of the necessary squares. Another problem had to do with space... the squares were strewn across the floor, and taking shape, but overlapped, and not in a convenient grid, or rows, so it would be impossible to maintain the design, on the floor, until I could piece all the squares... the obstacles were mounting, and that's not even taking into account Mister Foo's curiosity and playful antics. 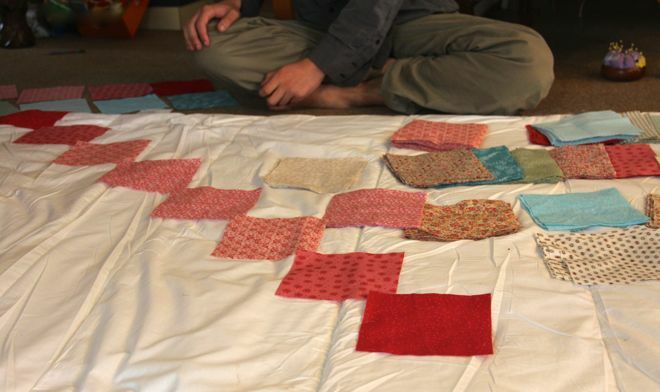 Seeing this, how beautiful the quilt could be, with thought and planning, I resigned myself to doing something better than random. For now? 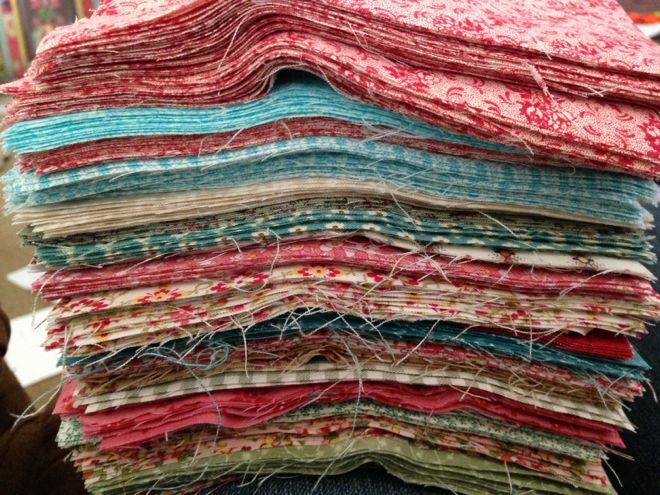 I am back to a stack of comforting colors, and no idea where to go next! Thank you, Judy... you are helping me keep a healthy perspective! Such a beautiful stack...how about alternating warm and cool colors without a cool touching a cool and vice versa with the warm colors. Good luck to you. I am going to see what I can do with this suggestion. And maybe I need to break down and buy a little more of some of these prints.